One week ago TNA Wrestling was criticized for not putting Bobby Roode over for the TNA championship. A week later that has changed and guess what? Those same critics are still complaining. Can this company win with anyone in 2011? The Internet Wrestling Community buzzed all of last week with TNA Wrestling’s decision not to put Bobby Roode over for the title at Bound for Glory. A year of build ended with Roode staring aimlessly into the crowd as Kurt Angle limped to the locker room after pulling off the upset. Less than two weeks later, a lot has changed. Be warned. The following will contain major TNA Impact Wrestling spoilers. Stop reading now if you don’t want to read spoilers. Okay, you have been warned. As most of you know by now, Roode was reportedly scheduled to win the title at Bound for Glory. 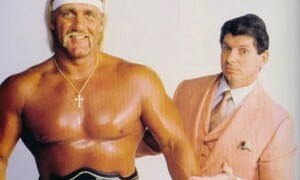 According to dozens of reports, Hulk Hogan called an audible and changed his mind the day of the show. Hogan and Bischoff are running the show right now and according to many, Hulk felt Roode wasn’t ready. These reports incensed fans and even some of the wrestlers in TNA. TNA Wrestling then taped episodes of Impact over the last week and half. A lot has changed and the booking is very reminiscent of how the WWE would handle their post WrestleMania booking, by introducing new storylines and character changes. So it should be no surprise that the TNA bookers have given the company something of a reboot following their biggest show of the year, Bound for Glory 2011. It all started the night after Bound for Glory when James Storm shocked the world and defeated Kurt Angle in a minute to win the TNA championship. Fans were caught between confusion and anger at seeing anyone but Bobby Roode get the strap. I certainly saw Hogan’s argument about Roode but to tell people that Roode isn’t ready and Storm is, well that is where you lose me. Once news broke of the title change I joined the camp of critics, although Hogan told the critics to wait and see how it played out. The criticism got louder when TNA began promoting a match between Storm and Roode for the title on free television. Fans and bloggers felt that TNA was rushing an angle that could have played out for the next year (as it did in Ring of Honor). The decision to put the match on free television as opposed to pay per view was not questioned, it was declared foolish by most. I’ll get to that in a moment. TNA taped the match Wednesday night in Macon, Georgia to air on Impact Wrestling. It didn’t take long for the news to break after Bobby Roode defeated James Storm for the championship. According to reports, Roode broke a beer bottle over Storm’s head to win the title, and thus turn heel. Roode later attacked James Storm so viciously, that Storm may sit out all the way through TNA Lockdown to sell the injuries. The night of Impact tapings ended with Roode leaving town with the title and heading to Turning Point to defend the title against AJ Styles. That all sounds great right? Nope, well not according to the TNA haters (and count me in, I am not a fan of the product). Social media was ablaze in TNA hate and criticism as well as many noted bloggers and journalists. Dave Meltzer and Bryan Alvarez ripped the booking apart on their F4Wonline.com podcast. I sat there listening to it and at that point something strange happened. I started seeing the other side, the dark side, yes I started to see it through TNA Wrestling’s eyes and I came to the conclusion that not only is this company not getting a fair shake, the angle totally makes sense! First of all, let’s start with the Roode heel turn. Why would they turn him after building up as a big babyface over the last year? For one, everyone seems to forget that Kurt Angle is badly hurt. There is a spot open for a top heel that needs to be filled. Without Angle around, who was the company’s top heel? Jeff Jarrett, Eric Bischoff, Scott Steiner, Ken Anderson? Could you imagine the scathing criticism TNA would get if Jeff Jarrett wound up with the title? Why not Bobby Roode? A big criticism of the turn is that TNA spent all of this time pushing Roode as a babyface, showing video of his family, etc. Hello, what better timing to turn him heel than after a year of building him up as a sympathetic babyface? What value would there be turning Roode a year from now? By then he’d be watered down and wind up squashed back to the middle of the pack. He is hot, he is seen as a top guy, and the emotions are exactly where they should be. The timing is perfect! Did TNA miss a business opportunity by putting this match on free television as opposed to pay per view? Have you seen the TNA buyrates? If you want eyes on the biggest angle in company history, than why would they put it on pay per view? If the end game here is to sell the grudge match when Storm returns, I look at this as a loss leader. They will make much more money on the grudge match than they would if they put their first match on Turning Point. TNA would be fooling themselves to think otherwise. Did they rush the angle? Maybe they did, maybe they didn’t. Let’s face it. The big angle right now in TNA is Hulk Hogan vs. Eric Bischoff. Anything Roode and Storm would have started would be overshadowed by the big boys. Hogan and Bischoff will hopefully have ran its course by the time Storm comes back, thus they jump right into the top spot. Even if that isn’t the case, fans will have the emotional investment of seeing Storm come back for revenge no matter what Bischoff or Hogan are doing. I can see both sides, but I don’t think it is definitely right or wrong either way. In the meantime, instead of getting the same old formula of Kurt Angle vs. Sting, Ken Anderson, or Jeff Jarrett for the TNA championship on the next pay per view, fans are getting AJ Styles vs. Bobby Roode. That has the potential to be the best pro wrestling match on pay per view period in November. At some point you will get Roode vs. Storm in the main-event spot. Could 2012 finally be the year that TNA main-events blow WWE headliners out of the water? Finally, this angle has me! I can’t remember the last time I have been excited or even inclined to tune into TNA Impact to see this thing play out. I love the freshness of Roode as heel champion on top, I love the dynamic of him vs. Storm, and this whole thing sounds a heck of a lot better than anything I have seen on Monday night recently. TNA, you got me! I am not saying that you are wrong to hate this angle or criticize, but at least take an objective look before you start throwing bombs at the Impact Zone. I probably haven’t said this in six years (since Samoa Joe and Kurt Angle brawled in the Impact Zone), but I really like where TNA is going.